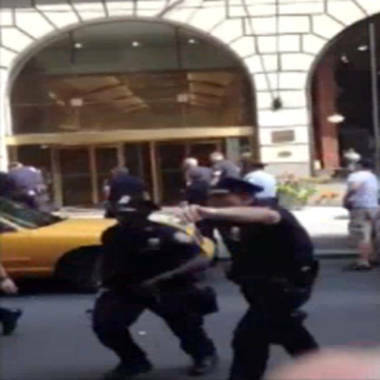 Cell phone video shows police chasing a man they shot near Times Square Saturday afternoon. Updated 2:15 p.m. Sunday: NEW YORK -- Police shot and killed a man who threatened them with a large knife near Times Square Saturday afternoon. Officials said the man, who police observed smoking marijuana on 44th Street and 7th Avenue, became agitated when officers approached him. He then pulled out an 11-inch knife and raised it over his head. Officers ordered him to drop the weapon, but he refused, police said. As the man backed down 7th Avenue, police pepper sprayed him six times to try and disarm him, but the man continued to threaten officers with the knife. Police said that as he neared the corner of 37th Street, he lunged at officers with the knife, forcing them to shoot him. Two officers fired a total of 12 shots, striking the man in the chest, groin, left arm and left calf.